I like to keep things very simple when it comes to play spaces. When a great deal of thought has been put into creating play spaces for children, then it is surprising how few things you need to fill it. 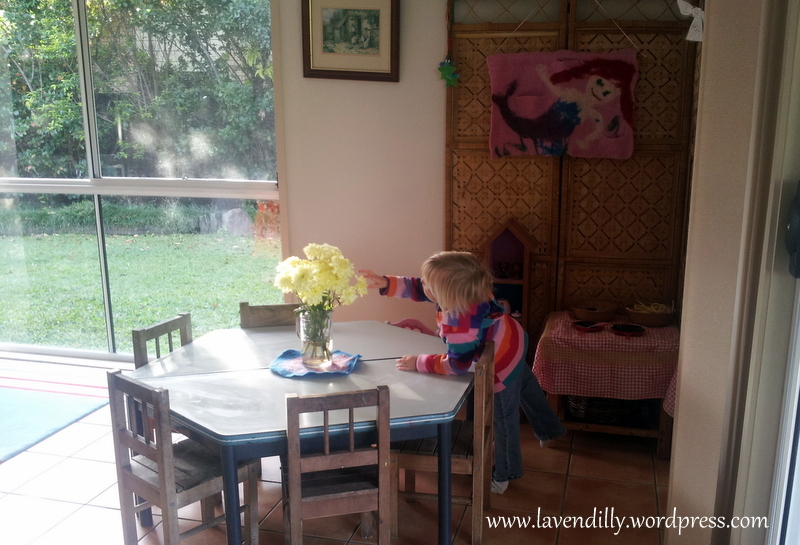 The less furniture and playthings there are, the more children need to become inventive and imaginative – and also when there are only a few things to put away, then the less overwhelming a task this is!! That is definitely a bonus. 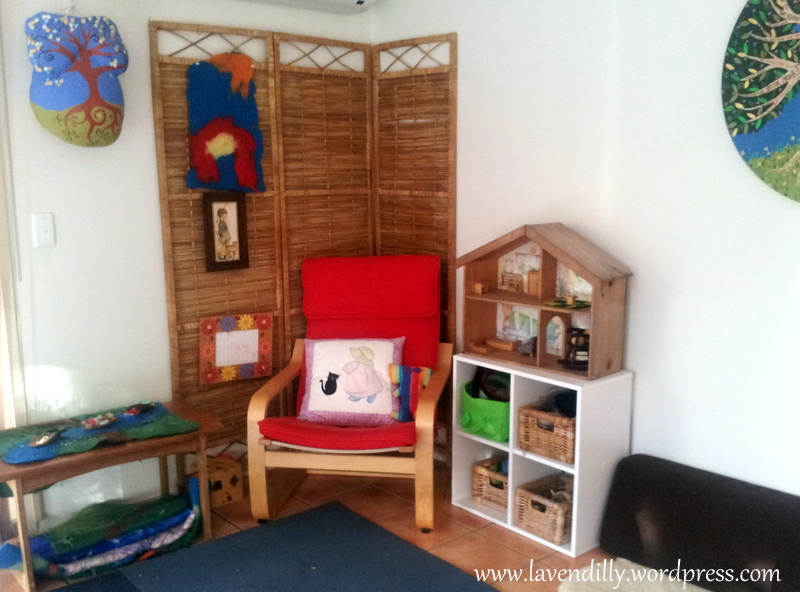 So here is a tour of our playroom, which is used by my three children and two playgroups. We have comfy places to sit: one couch, one chair and some cushions. These are not precious: they’ve been scribbled on and dribbled on, scrubbed and cleaned over and again! These spaces are where we share books, fold washing, relax with a cup of tea or have a cuddle. I have a few tables that are easy to clean and multi-purpose. 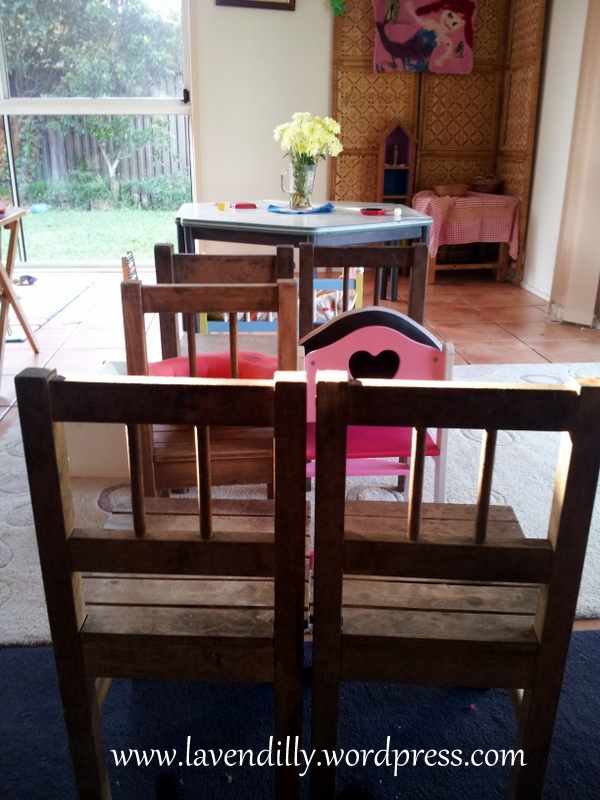 I was lucky and was given some second-hand child care tables that can be arranged in different ways. I also have a couple of coffee tables that are short enough for children to work at. Sometimes they are for drawing, sometimes they are for “cooking” at, sometimes they are for stories .. sometimes they are turned upside down are used for building. Its the chairs that have been the best toys by far in the playroom. They are so useful! 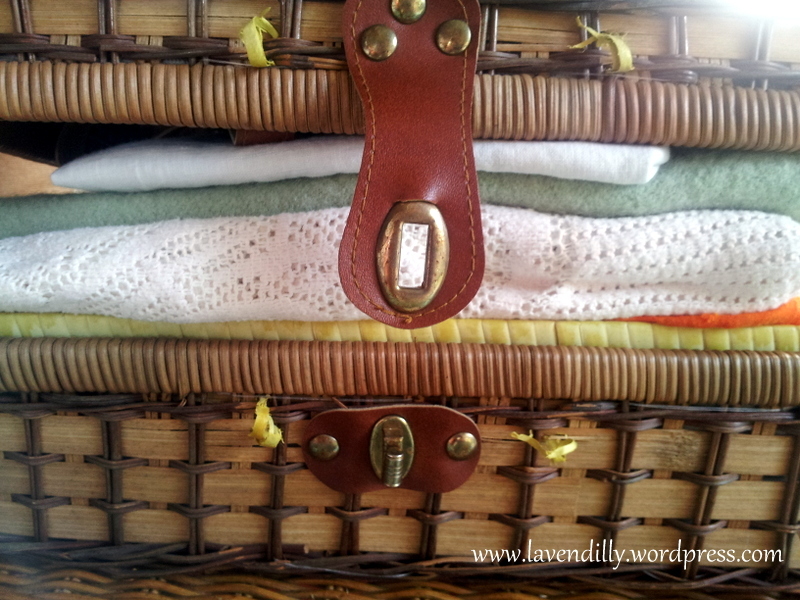 A bedside table holds some home corner necessities: a basket of dress up accessories, a basket for keeping folded blankets, a basket for lots of different hats. I love having blankets and cloths in the playroom. The children use those more than the dress-ups, and for so many things! Capes, crowns, table cloths, landscapes for stories, bandages, wraps for babies. We’ve made knot dolls with them too and they do come in handy for cubby building. Learning how to fold cloths is a great shared skill too. Next to the bedside table the dollies are tucked into bed. I made these dolls years ago. They are old and raggedy but every now and then we give them a bath and fix them up. Nobody seems to mind they are a little stained these days. A play stand my husband made for me years ago holds our dress-ups. 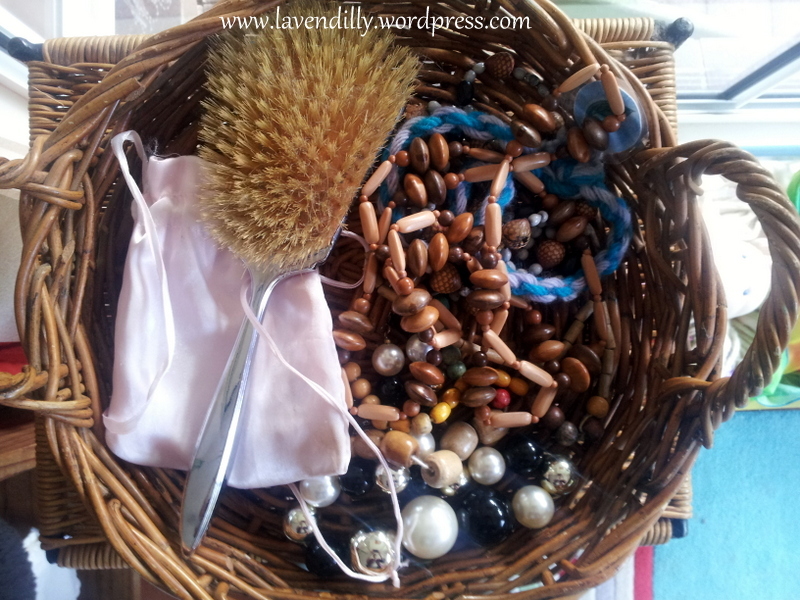 Some were given to me, some I have made, some I found in op shops. 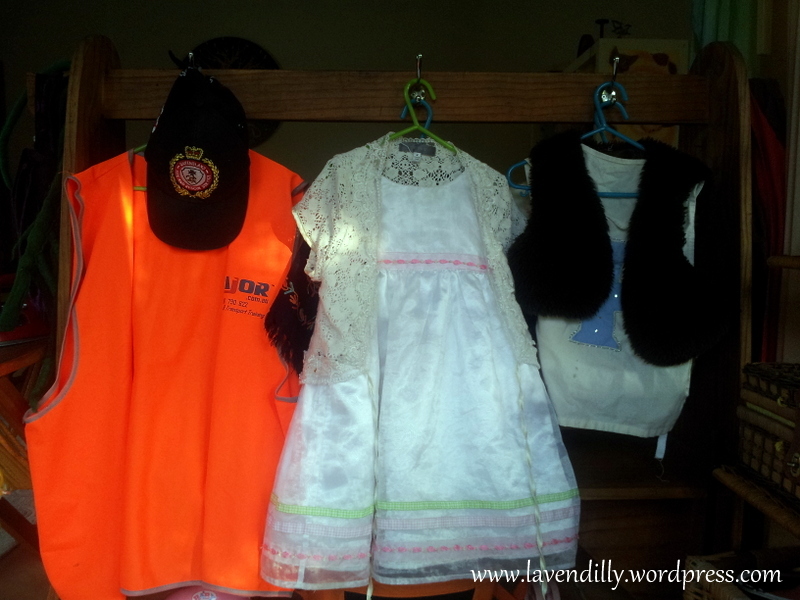 I like to have an assortment of open-ended clothes for all dress-up emergencies! Waistcoats, dresses, jackets and scarves. Not too many to put away. This cd shelf was a good find! I discovered it in an op shop and we painted it at home. It has been a doll house tower, a castle, a shelf for baby toys and is currently being used as a home corner kitchen shelf. See what we have on there? Not much, but it seems to be enough. 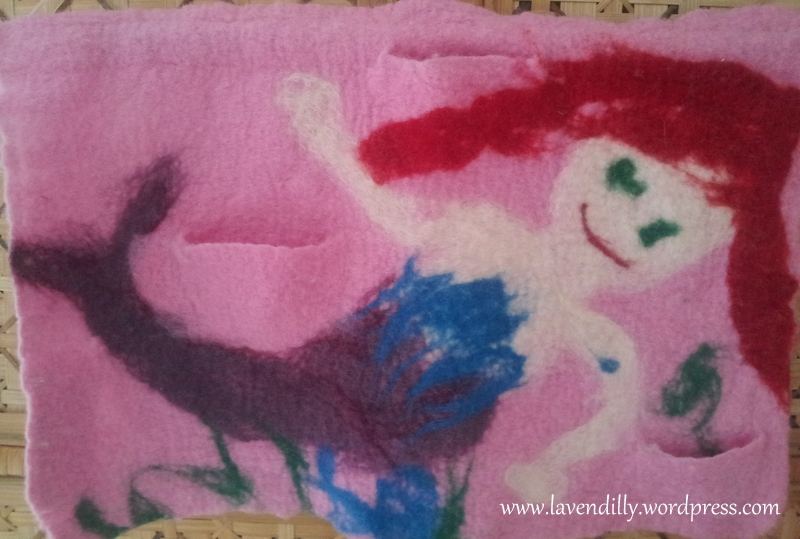 Here is a felted wall hanging my daughter made when she was four years old. I like having my children’s artwork in their playspace. It celebrates their individuality and imagination. A little coffee table is where the cooking happens. All they have to cook with at the moment is some felted noodles and some colourful stones. I switch it around now and then. I had to move the crayons away from home corner because I was forever looking for them .. and finding them in the play wok (which was a great find in a second-hand store!). The doll house lives next to a comfy chair. 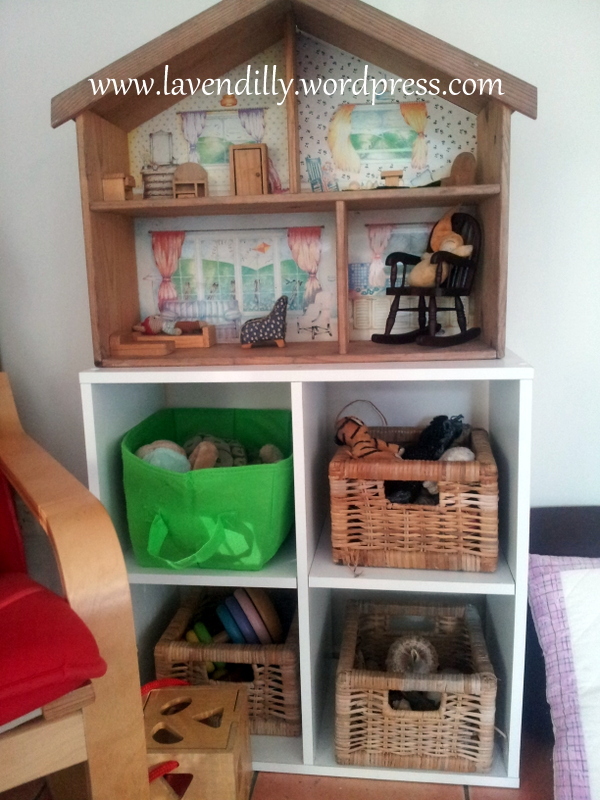 The shelf under the doll house has a basket for dolls and animals, a basket for baby toys, a basket for nature items and a basket with just a few small soft toys and hand puppets. Another coffee table has a variety of felted play mats living underneath it. 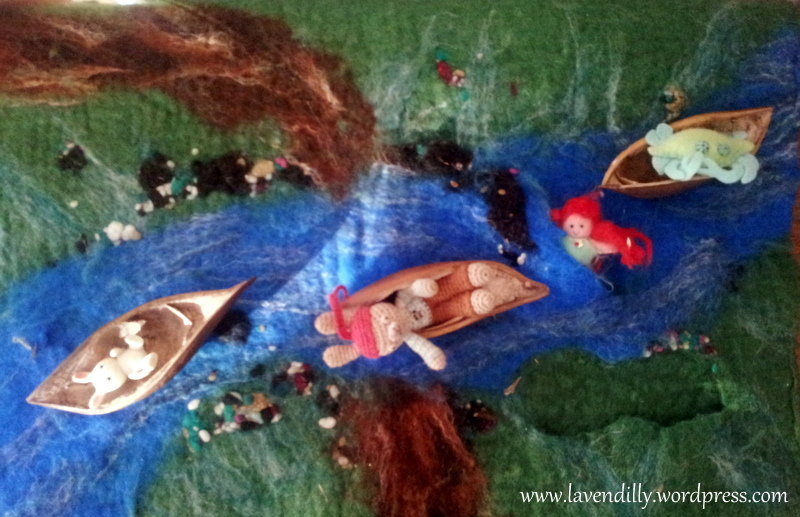 Children use these playmats to tell stories with the little dolls and the nature items. Currently some boats are going for a sail on the river. Out on the covered patio (where we don’t have to tidy it up every day!) the car mat lives with the wooden blocks, duplo, train set and the cars. This collection has been culled. If it doesn’t fit in the basket we don’t need it. 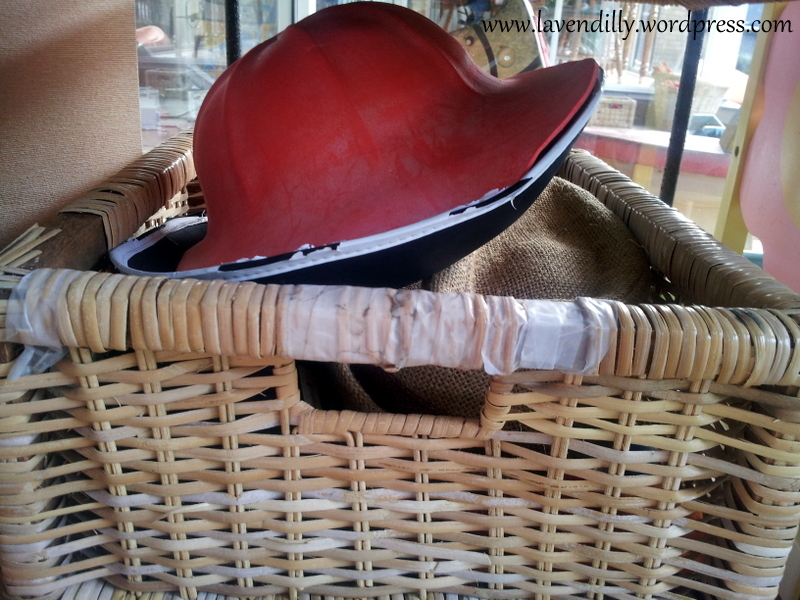 There is an old wooden rocking horse living here too. That’s all we have inside and it has always been enough. 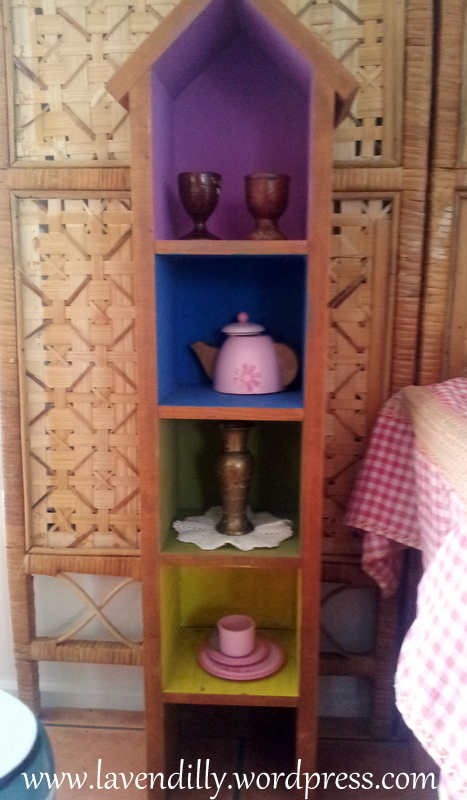 My furniture is old, mismatched, a little beaten up, most of it has been given to us or found in second-hand stores. The carpets are stained. Many of my toys I made years ago, and they are a little shabby now. I fix them up when I have time, but time isn’t always available and nobody appears to mind the ‘old-and-loved’ look. Nothing is precious in our play room, but the space is still treated with love and respect and it is always filled with so much fun. Having playgroup use the space also means it gets a great clean once a week! I’ve always looked longingly at websites and catalogues for purpose-built play furniture, play kitchens and the like. I’ve drooled over pictures on the internet of other people’s pretty playroom things … but somehow we’ve never really needed it because with the bare essentials and a lot of imagination, we’ve just continued having fun with what we’ve got. Well loved and well used is best. If they were pristine then they’d be useless as they wouldn’t be used.